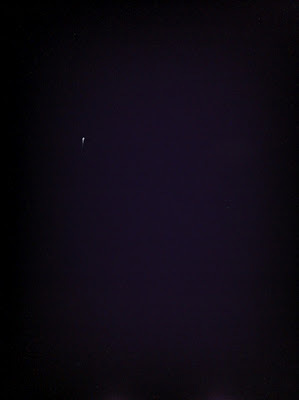 I haven't done an exhaustive search, but I can't recall ever seeing another iridium flare photo taken with an iPhone. 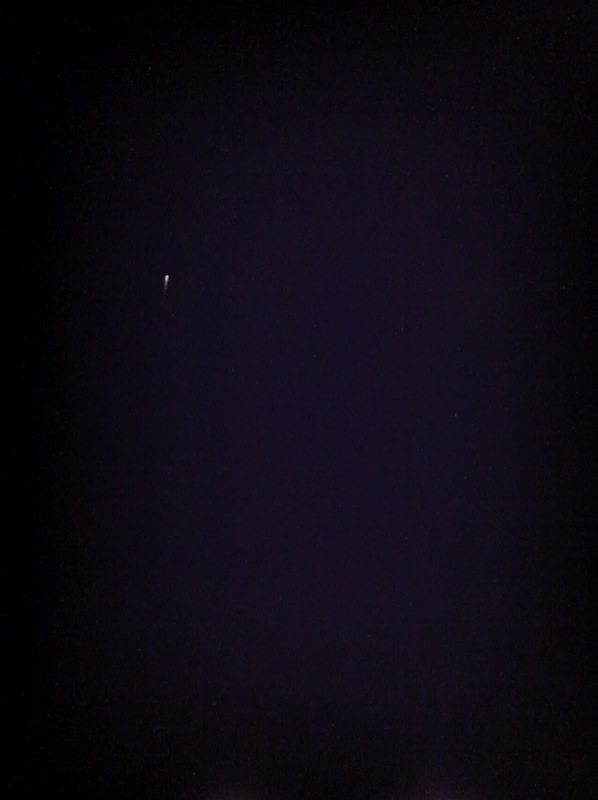 I've seen quite a few long exposures of ISS passes, but this might be the first iridium flare photo captured directly on an iPhone camera. I used Slow Shutter Cam () in Light Trail mode with light sensitivity to 1 and exposure time on 'bulb.' 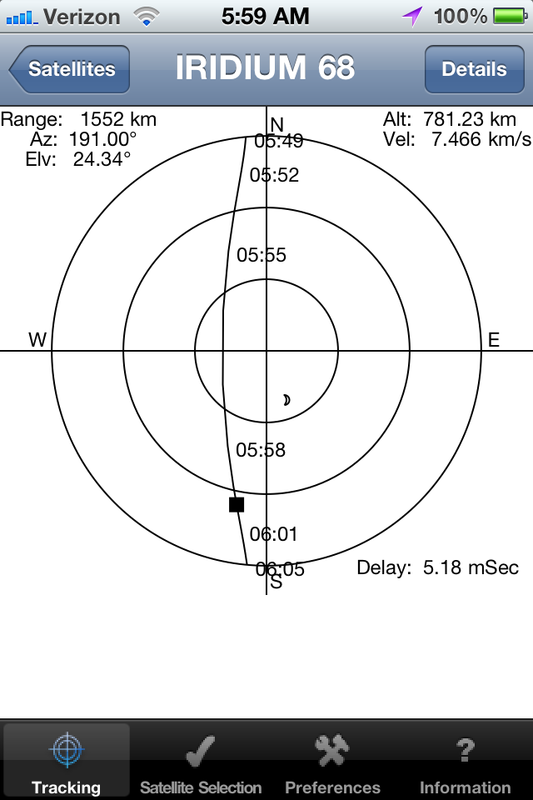 This -8 magnitude flare from Iridium 68 was visible at 5:58 am over Bowling Green, OH. I woke up at 5:50am, threw on some flip flops, and ran outside in time to see it. I propped my iPhone up against the rear window of my car to try to stabilize it. I hadn't anticipated the bright moon would be so close to the satellite in the sky. 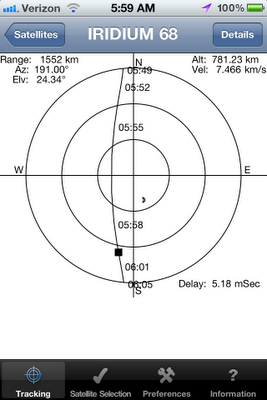 I must say, for a -8 magnitude flare, I was a little underwhelmed. The waning gibbous was only about 3 fists at arm's length away from the flare (ballpark 30 deg or so) - so I guess I'm lucky to have seen it at all. There is another -8 magnitude flare predicted for Saturday night over Bowling Green at 8:15pm, 47 deg altitude to the North. In this zoomed in crop of the original photo, you can see the bright middle of the flare as it starts to fade out moving from top to bottom. Normally, iridium flares fade in and fade out over a period of about 30 seconds, producing long streaks on time exposed frames. However, because of the proximity to the moon, and the low light sensitivity on the iPhone camera, it's all over in a flash (har har). This was also my first time seeing an iridium flare in person! Definitely worth waking up a little early for. Alright, it's Friday, back to bed!